This month, we feature Matthew Cummins, BSO cellist, for our Musician’s Musings. This article was written shortly before our first concert of the season, “In the Spanish Style,” but we haven’t had a chance to post it until now. We hope you enjoy this opportunity to learn more about our players. There’s a beautiful moment at the beginning of España by Chabrier that puts a smile on my face every time we play it. The piece begins with a series of pizzicatos in the string section, starting with the violins and violas and quickly joined by the cellos. As Maestro Laureano raises his baton to count us off, one might expect that all eyes are on him. Instead, the string players’ eyes are all on each other. The exposure and timing of the pizzicatos requires a precision and unity that can only be achieved by doing this; that is, by watching and moving together, at the same time – the very definition of an ensemble. Of course, playing as an ensemble is one of the keys to success for any piece, not just for three measures of my beloved España. It’s not easy to do, and conductors like Manny constantly have to remind us to get our heads out of our music stands, and to get our eyes and ears off of him (but not for too long!) and onto each other. What can help make ensemble play easier, though, is when you have a tight-knit group of musicians that know and care for each other. In the 16 years I’ve been playing cello, I’ve never been part of an Orchestra where that’s not the case. That’s one of the main reasons I love playing in Orchestras so much. There’s always a strong sense of community that tends to foster many life-long friendships and enjoyable moments. 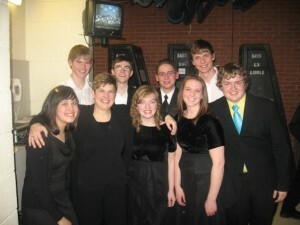 Of the friends I still see from high school, almost all of them were in Orchestra with me. Every time we get together, we always laugh and reminisce about the good times we had: going out to eat downtown before playing at Orchestra Hall; competing against each other in auditions for first chair; and playing an entire concert without a C string (not me! ), among other shenanigans. The best testament I can share around this goes back to the 2007-08 All-State Season. I knew two other people going into the season, but everyone else was a complete stranger. After less than a week at St. Olaf, I came away with a lifetime of memories and some fantastic new friends – an All-State Clique, if you will. We’ve seen each other once or twice a year ever since, and it’s usually shortly after those get-togethers where my stomach hurts from laughing so hard. It’s simply amazing to me that a bond that close can come from less than one week of time together; but that, to me, is the power of music. What excites me most is that I see great potential for something similar to come out of my time playing with the BSO. This is my second year as a regular member, and I’m already feeling like a part of the community. Truthfully I didn’t think it would be that quick, since I knew coming in that most of the musicians had been in the Orchestra for many, many years. I’ve come to find out that my concern was unfounded; all of the musicians are so welcoming and take a genuine interest in each other. I can’t wait to continue to get to know more of the members and to form new friendships. Who knows, maybe a BSO Clique is on the horizon? For now, I’ll keep smiling as Manny gives us the downbeat on España, with the other musicians smiling right back.